If this post and the lack of sentimentality and gooey lovey goodness upsets some people… sorry. My sense of humor runs dark. But, you need a strong sense of humor to get through this world and nothing exemplifies that more than a holiday like Valentine’s. It’s like New Year’s. People… have… such… expectations. And they never seem to be fully realized. Too much of a downer? Oh well. Nothing like a little sugar to perk you back up. This is my super duper sugar cookie recipe. I don’t vary, this is the only one I use. It’s pretty flawless which is a hard thing to come by when it comes to sugar cookies. They can be a real pain in the buttocks. As I’ve said before the problems usually come about in one of several ways. 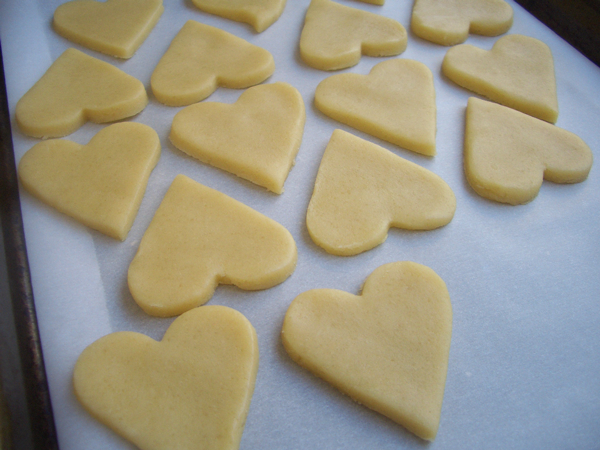 1) Leavening–sugar cookies don’t need it, and when they have it they puff up and obliterate the fine edges needed to see shapes clearly. 2) Drama–they often require oodles of refrigeration time–something the average person often notices too late. C) Burn baby burn–they need to be thin and firm and buttery–a combination that makes them ripe for scorching. Getting it just right is hard, but not as hard as a lot of recipes make it. I tried so many before I finally played around with butter to flour to sugar ratios and came up with something that works every ding dang time. I don’t know. You’ll either feel the flow with this or you won’t, but if you do, I’m sure there will be no end to the ideas. 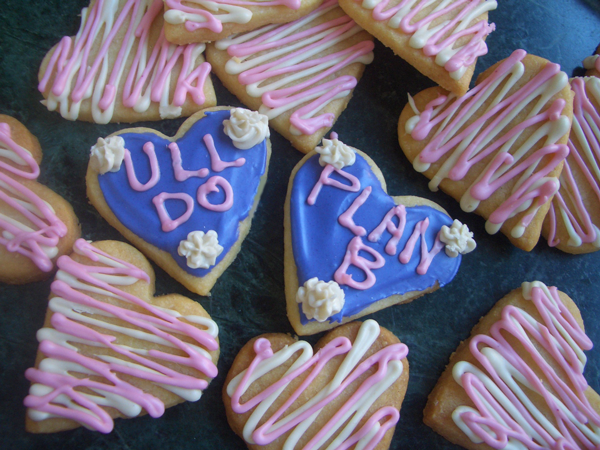 If you need a lot of icing because you want to use different colors, double the recipe. Separate the egg. In a standing mixer or with a whisk, mix the egg white with 1 cup (240ml) sugar and the cream of tartar. Add more sugar by the tablespoon until it is a consistency that holds stiff peaks. Don’t leave the icing sitting around uncovered or it will harden. Cover with a damp towel in-between use. After decorating, let the cookies sit at room temperature until the icing has set. Then the cookies can be stored in an airtight container stacked on top of each other without smearing.